I love travelling, and I stay in hotels on a regular basis. I must admit my experience of the Travelodge chain has been varied. The good includes the Travelodge Covent Garden, a great priced hotel in a central location, clean and decent size rooms and the not so good, well I won't go into that here. So when I was given the chance to review the Cardiff Central Travelodge, just off Queen St, I tried to go into it with an open mind. Travelodge has spent over 57 million on a programme of refurbishment over the last year and it shows. Customer satisfaction has apparently doubled in the past year. 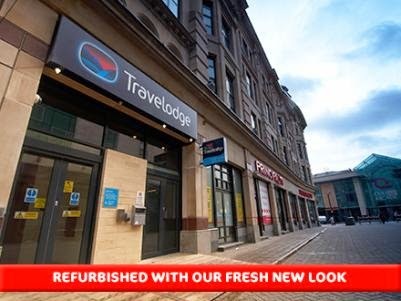 First impressions are that this Travelodge is in an excellent location on a side street just off Queen St, the main shopping area in the centre of Cardiff. The street has pedestrian only access and parking is two minutes walk away. We parked in the NCP car park, Greyfriars Road. Parking here is £18.50 for 24 hours. When you are considering staying here it's a factor you would have to consider. To get to the check in you have to go up one floor to the reception. On check in, the receptionist, Jade, was friendly and helpful, explaining the usual such as breakfast time, check out time and the like. She also advised that there were no air conditioning or hair dryers in the rooms but she could provide a hair dryer and a fan if requested. I asked for a hairdryer as I do think rooms should have one and my long hair takes ages to dry. They made a note of it and gave one to me, there was also no charge. Our room was on the third floor and we went up in the lift which was small but of course, you can take the stairs if you do not have mobility problems. When we got to the room we were pleasantly surprised. The rooms appeared freshly painted and everything looked in good condition. There were tea and coffee making facilities and the bed felt comfortable when I sat on it. There was a small desk and chair in one corner of the room. The TV was small but modern and fixed to the wall. 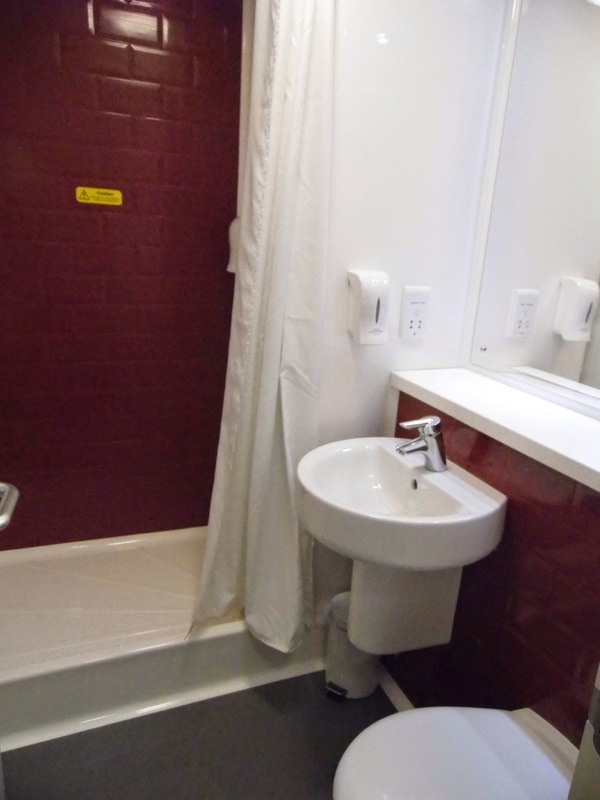 The bathroom was compact with a modern sink and toilet and the shower and had red brickwork adding a retro and designer touch. I was pleasantly surprised by the room, it was in great condition and the only thing that let it down was the small window and the fact it would only open a couple of inches. There was no air conditioning in the room and on a summers day, you would need a fan as it was comfortably warm in September. The room was at the back of the building which was great as although it did not have any view it was relatively quiet for the position. Later on, we used the bathroom and although compact it was perfectly fine. Everything was spotless but there were only two bath towels and no hand towel in the room. 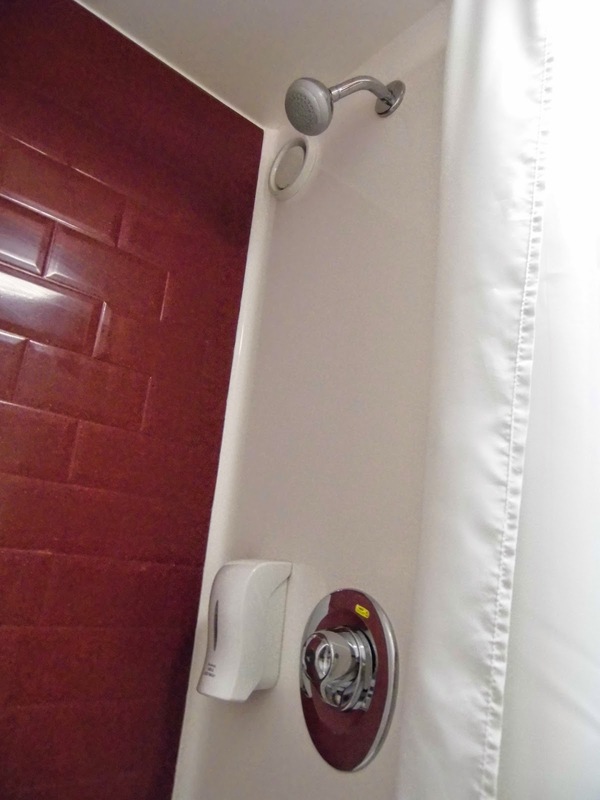 The shower had good pressure and body wash was available through dispensers on the wall. We then decided to go downstairs to try the food menu. As we were waiting for our food I chatted to Jade, the receptionist. 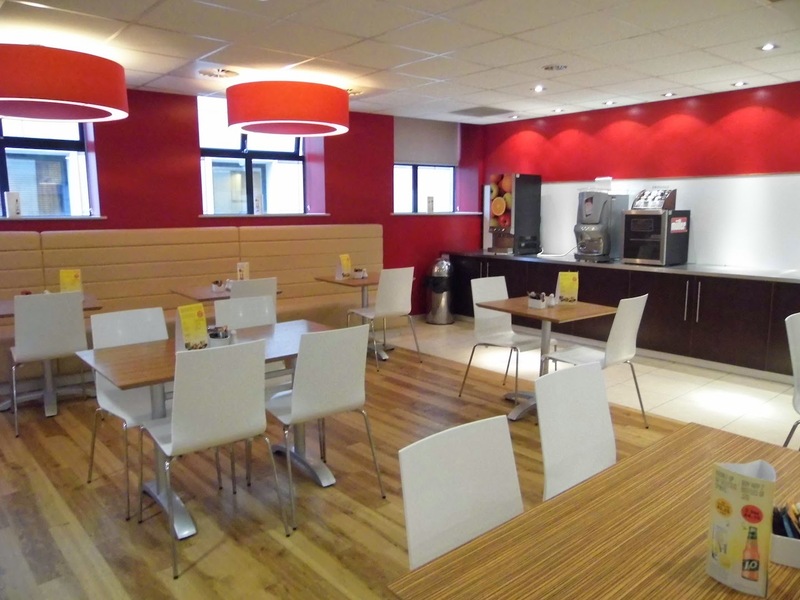 She stated that the refurbishment had gone on in June when they had new beds which were much better than previous. Overall the furnishings were of a much better quality than previous. I asked if there was any problem with noise due to the central location. She said that if we noticed any noise they would be happy to move us but she thought it would be quiet as our room was situated on the back of the hotel. That is one small concern on the location as I think if I stayed here on the weekend it would be noisy due to the proximity of a club across from the hotel. 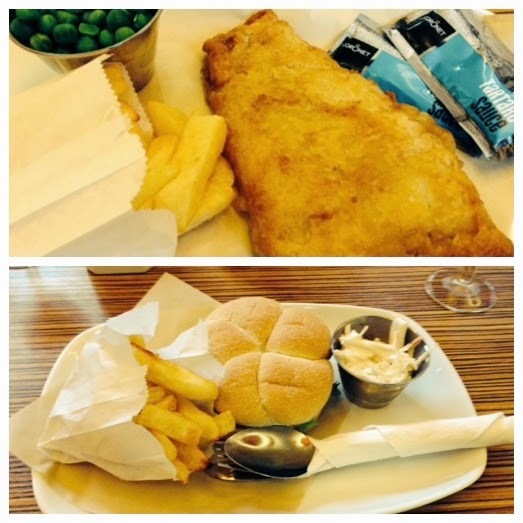 We ordered off the food menu - there was a wide choice, with a main course with drink priced at £9.95. When it came, the food was of decent quality. My husband rated the vegetarian burger highly and I thought the fish and chips were good. The Sauvignon Blanc was good for the price at less than £3.50 for a glass and had a good balance of flavours. We went out that night to see a comedy show and on our return, the room was much cooler. We saw someone ordering pizza from the 24-hour menu and it looked delicious. It's good to know you can order food 24 hours a day. We slept well and the bed was very comfortable indeed. 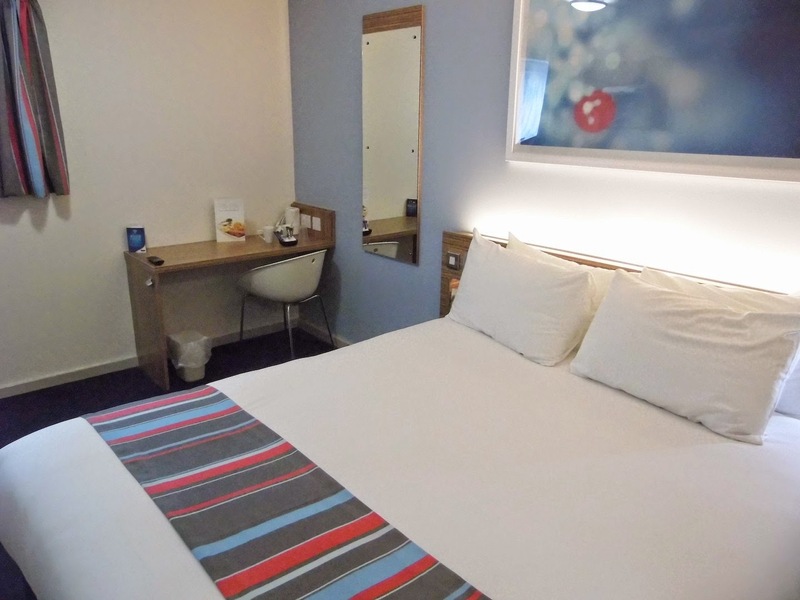 Travelodge are proud of their king-sized sleepeezee 'dreamer' beds and they do add a luxury feel to the room. The next day we tried breakfast. At £7.95 you get a choice of hot dishes including sausages, bacon, beans, and so on, as well as cereals, toast, muffins, yoghurts and croissants. The fruit offered was grapefruit and I would have liked it if there was more choice here. 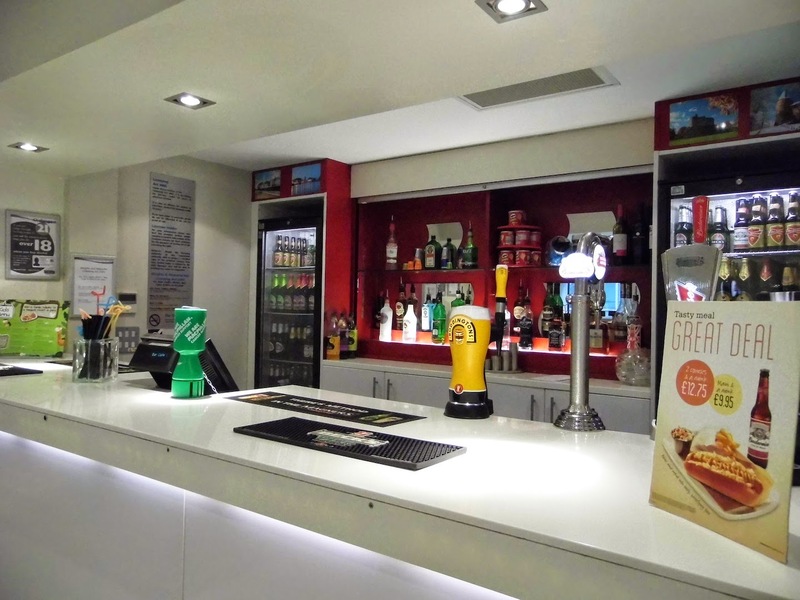 Hot and cold drinks are also included. The hot breakfast had appeared to have been waiting around a little, and this was probably because it was not that busy. Would I have breakfast again? If I was in a rush perhaps however with the centre of Cardiff on your doorstep, I would personally go into the city. In conclusion - with rooms from £38 on a weekday the Travelodge Cardiff is good value. If I was seeing a concert in Cardiff and staying mid week I would certainly stay here again. The refurbishment was of a good standard. Food varied but the lunch and dinner menu was ok. Staff were all pleasant and efficient. Ask for a room at the back of the hotel to avoid noise. Travelodge you have gone up in my estimation! Would I stay there again? If I was on a tight budget yes I would. For a budget stay they are so much better than they used to be. Yes it looks fresh and modern. I stayed in the Rugby one with work and it was the hottest place on earth!! Oh dear. Hope you got offered a fan. Travelodge do offer very good value. I have used them quite a few times. They are even better value now with the refurbished rooms. The room looks really nice, and the price is good. I haven't stayed in one for about 10 years. You will be pleasantly surprised. I have always had a positive experience at the Travelodges we have visited. I always find that they are clean, friendly staff willing to help and the rooms are priced well. Thanks for a great review. Yes you are right. Now that they have improved their beds too it is even better than before. It's always good to find an inexpensive glass of wine! And this whole package looks tempting if you're looking for a bargain. Would it suit travellers with young children, do you think? Yes I thought the price of the wine was a bargain to be honest. They seem better value than ever now they have refurbished their rooms. The rooms are a bargain. We tend to use Travel lodge when we can, they are good value for money. They are exceptional value for money. It is good value for money. I wouldn't dine in, but great for an overnight room. A good choice for an overnight room, I agree. We stay in budget hotels a lot but one thing we always insist on is on-site parking. This is when we went to Cardiff earlier in the year we stayed outside the city. There are hotels with onsite parking in the centre of Cardiff, but just not budget ones. That's a good price for a midweek stay, and the refurbishment sounds good. I've heard good things about the Travelodge in Covent Garden too. I couldn't fault the Travelodge in Covent Garden. It is in two parts. Just be sure to go to the modern side. Yes great for when you want to attend an event. Have you tried the new beds? They are so good I am thinking of buying one - seriously. We stay in Travelodge fairly regularly and I think they're a great brand. I haven't tried the new beds yet and can't wait to do so! You are in for a treat then! Have you stayed in one recently Fritha? I like travelodge and always stalk their site for bargain rooms! Yes they do have good room rates in the sales. It was clean and fresh with the new decor. Sounds perfect for a mini break, the room looked really fresh and modern. It was fresh and modern and no scuff marks on the paint even.